4-Word Review: He loses his hand. Jon Lansdale (Michael Caine) is a gifted comic book illustrator who loses his hand in a freak car accident. They are unable to locate the missing limb at the scene and therefore unable to reattach, so he’s fitted with a prosthetic one made of metal. In the meantime the severed one goes on a murderous rampage killing all those that Jon has a problem with. The film, which is based on the novel ‘The Lizard’s Tail’ by Marc Brandell, can best be described as an experimental horror and to some degree is quite intriguing. I liked the psychological subtext showing the hand as being a symbol to Jon’s subconscious and acting out the anger that he felt from others, but ordinarily too reluctant to do anything about. The story conveys a very universal message that we are in many ways two people, the one we choose to display to the world and the other more politically incorrect one that we try to hide from it. Had it remained more on a subtle, intellectual side it might’ve worked, but showing the severed hand as much as it does is its biggest downfall. The scenes showing the hand strangling people looks quite tacky as instead of seeming like the victim is trying to pull the hand off of their throat it looks more like they are trying to hold it in place so it doesn’t fall off. It also brings up all sorts of unanswered questions like how is the hand able to move around so quickly and sneak inside buildings and cars and where does it get the strength to strangle people, or jump up to their throats when all the muscles connected to it have been severed away. It would’ve worked better had the hand not been shown at all and kept a mystery as to what was causing the murders and then only at the end expose the hand as being the culprit, which would’ve made Jon’s final confrontation with it much more startling and impactful. An even better idea would’ve been to have the metal hand act as the one that does the killing since this one resembled Freddy Kruegar’s and looked far creepier. Oliver Stone’s direction is interesting especially his technique of going from color to black and white and then back again, but the story drags on longer than it should and seems to give too much away. The twist at the end is great because it’s actually a logical one that makes perfect sense, but then at the last second Stone sells-out by throwing in tacky ‘second twist’ that is nothing but a gimmick that makes the whole thing seem too commercial. On the acting side Caine is adequate, but I found his wavy hair far more fascinating than the hand and I especially enjoyed seeing how progressively disheveled it gets the more insane that he becomes. Andrea Marcovicci is standout as his wife. Initially I thought she was too young to play his spouse as there was a 16 year difference between the two, but her very expressive face particularly her blue eyes and the way it conveys fear helps heighten the suspense. An old man comes upon some white stuff bubbling up from the ground and when he tries it he becomes addicted to its delicious taste. Soon everybody in the small town he is in becomes hooked to it as well. Some businessmen, who would never touch the stuff themselves, decide to market it as the next new variation of ice cream and call it The Stuff. 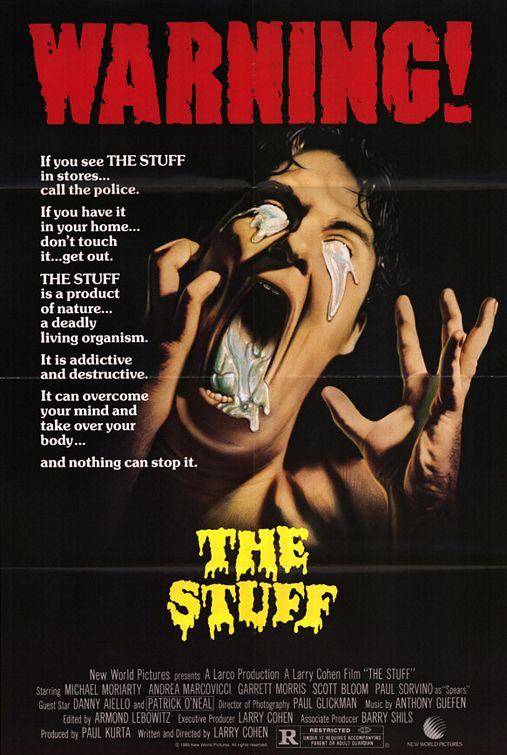 It becomes a national craze, but when 11-year-old Jason (Scott Bloom) finds it crawling around in his refrigerator late one night he becomes convinced that there is something wrong with it, but he can’t get his family to stop eating it. Mo Rutherford (Michael Moriarty) begins to get his suspicions as well when he is hired by a competing company to find out what the secret ingredients are only to come at a dead-end with people he talks to. When everyone starts to display odd zombie-like behavior the two join forces to shut down the company that produces. It is really hard to figure out what genre to put this thing into. Most movie sites list it under the horror category, but there really isn’t anything that scary in it. I might actually put it as sci-fi, but it is a bit vapid at that level. If anything I would say the true category would be as a parody of all those old sci-fi movies from the 50’s as well as a satire on mass consumerism. The special effects are hit and miss. The best ones feature the white liquid that looks like a cross between marshmallow topping, shaving cream and the white foamy stuff that comes out of a fire extinguisher. The best moment is when it starts to spew out of a pillow in a hotel room with such force that it completely covers a man with it and sticks him onto the ceiling. I also liked the part where actor Garret Morris has his mouth opened to an extreme size before he spits it out and then has his head explode. Scourby: You’re not as dumb as you look. Moriarty: Nobody could be as dumb as I look. As much as I love Andrea Marcovicci who is a truly beautiful woman to look at as well as a great actress I felt her character was not needed. She plays a woman who also teams up with Mo and Jason in their crusade to stop the Stuff. The romantic interplay between Mo and her character didn’t work and takes away from the quirkiness and edge that the Mo character had at the beginning. Having the heroes exclusively been between a kid and a middle-aged man would have been much more of a fun novelty. The film does not have the schlocky, low budget production values that are a characteristic of most Larry Cohen movies. The lighting, variety of locales and reproduction of an Ice Cream factory are actually quite impressive. This is also one of the few films where you get to see the inside of a liquid storage truck. However, it lacks any type of interesting twist or payoff. There is never any explanation about what this white stuff is, or how it got there. There is also hundreds of potentially interesting scenarios and story threads that it could have taken, but doesn’t. In the end I felt this thing was just tapping the surface and the final result is rather empty and forgettable.